Time is short. I’m going to skip the bit where I explain that Dexy’s Midnight Runners were more, so much more, than the School disco gypsies that most of the Northern Hemisphere remembers them as. Sure, I’m handing our credits here. Fill your boots. There’s a quote variously attributed to Nick Lowe, Elvis Costello and various other smarty pants rock stars that goes thus: “writing about music is like dancing about architecture.” It’s a peach. Plus, as a bonus, it’s pretty accurate. How then to write about Dexy’s Midnight Runners, and Kevin Rowland in particular, a band and a singer who, at their most fearsomely intense, used their music as a platform to struggle publicly, forlornly and beautifully to express the essence of what they wanted their music to be? They never reached the purity, the core that they sought and if they couldn’t express what they wanted for their music in the form of their music then writing doesn’t stand a chance. So, I’ll dance for 400 words instead. Before we speak of Kevin and his heart of fire, let’s be sure not to skip past the sound his band made. The sound he made them make. Rowland conceived Dexy’s Midnight Runners as a hard-hitting hoodlum soul revue and he drilled them, technically, physically and mentally, until they were the outfit he needed. Then, after their first album, they all abandoned him and he started again. The band we hear on this, their second record, is almost completely new and (perhaps we shouldn’t be surprised) despite the additional adornment of fiddles and dungarees are harder, bolder, tighter and punchier than any other Runner’s incarnation. Hear how they push and push their way through ‘I’ll Show You’, piano, horns, strings, drums hitting every step, every sublime transition together and hitting them hard. Try to spot a single crease in ‘Until I Believe In My Soul’ a 7 minute gospel torch song that sweep inexplicably into a jazz pastiche and back out to a floor thumping, chapel-filling cri de coeur. 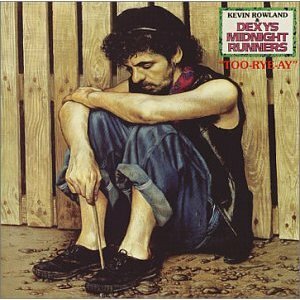 In Dexy’s Kevin Rowland fused the personal and the political then sublimated them. In this he and his band equalled, perhaps surpassed, the great testifying rock and soul acts. ‘Too Rye Ay’ is his least political and most personal record. It plays down his desire to reconcile his Black Country upbringing with his Irish heritage, which dominates much of ‘Searching for the Young Soul Rebels’ and ‘Don’t Stand Me Down’, and focusses on his urgent need to create something that will burn bright down the ages, a pure expression of abstract inner truth that will stand as no less than a monument to the beauty and the worth of the human soul. Sounds over the top? Fair enough and, by the way, screw you. Rowland’s lyrics are remarkable. Each song is like a workout, a battle as he fights to express himself, beating down the language, beating down the constraints of the form, throwing propositions back and forth in dialogue with his band members, searching, climbing, grasping for the secret resolution he knows is out there somewhere. And the Runners go with him creating elatory music to match their leader’s fervour. All this comes together in it’s most perfect form in ‘Let’s Make This Precious’, Rowland’s signature piece. The band kick hard, fast, joyfully, irresistibly. Rowland’s lyrics, his dialogue with the band and himself are a pure plea for purity, for commitment, for transcendence. Together they are striving, working, training and straining for something beyond the ordinary, something more, something that they can sense but cannot reach, something that will transform them, redeem them, save them. “Pure, this must be, it has to be. Their quest never reaches it’s end. They never get there, perhaps they never could. But, my goodness, ‘Too Rye Ay’ brings them pretty close. Epilogue: reversing the Curse of Devon Record Club, in the days after this last meeting Dexy’s announced the release of ‘One Day I’m Going To Soar’ their first album for 27 years. Nick listened: Dexys are an odd proposition; any understanding of them for me, and for most people I suspect, is so massively overshadowed by Come On Eileen (even more so than Geno, which I’ve read about countless times but don’t ‘know’) that it’s difficult to form any kind of relationship with them and their music. I tried to, years ago, by buying Searching For The Young Soul Rebels, in the hope that it would be the white soul classic I was looking for back then (I suspect it was, but I wasn’t ready for it, for whatever reason – the reason probably being Eileen). So, I’ve read more about Dexys than I’ve listened to them, but Come On Eileen is still burnt into my consciousness more than anything else about them. Rowland himself is a fascinating character, doing, as Rob points out, the musical equivalent of breaking the fourth wall, singing about the music he is singing, striving for something primal and honest. This was great (as was the Don’t Stand Me Down track that Rob played alongside it), and I want to know and hear more. Sadly, as ever, I think the distance of time elapsed between then and now, coupled with Eileen’s ubiquity and strangeness, will make any appreciation I come to of the rest of their ouevre just that; appreciation, rather than love. But I’m gonna keep looking out for Don’t Stand Me Down, lest it ever be around for less than £50, and try and pick this up too. Graham Listened: Since the mammoth success of …..Eileen, I have probably been doing my best to avoid Kevin Rowland. The first album had no real imapct on me at the time, but I could recognise Geno as a great tune. But being around at the time, the success of ……Eileen categorised Dexys as just another pop band for me. I can recall listening to this album at the time of release and really “not getting it”, as it were. I was probably expecting more of the pop classics like the singles and didn’t really get all the heart and soul searching. I can hear it now but still harbour doubts. Tom Listened: I have a friend at work who is really into early 80s ‘pop’…hell, I even caught him listening to a Heaven 17 Youtube mix the other day! I told him about Too-Rye-Ay being an offering at our recent DRC meeting, offering condolences that he wasn’t there but he replied that Dexy’s were never his thing. When I (incredulously) asked him why not, he related to their ubiquity at the time. In his words ‘you don’t come home and drink scotch when you’ve already got plastered on it in the club’. Now I suspect that with that statement he is not referring to Dexy’s, he’s referring to their crowning glory/albatross…that song…you know the one! The thing is, once you come to properly listen to the albums you soon realise that Come on Eileen is so far from being representative of Dexy’s that it has probably done the band more harm than good. That one song is, to most people, Dexy’s. And I haven’t met all that many people who don’t like it. But I also haven’t met all that many people who have explored the band’s output beyond it. And I guess the reason for that is that the song’s album is an awkward bugger, packed with disorientating time signatures, oblique lyrics and (horror of all horrors) more key changes than you can shake a stick at. So it’s really difficult to get to grips with (at least for me it is) and yet I feel as though, six or so listens in (Rob lent me his copy), this is probably a work of genius, passion, authenticity and other good words. One that’s very much worth persevering with and although I still wouldn’t say I have clicked with it yet, I am beginning to really enjoy the ride (and none of it is remotely like Come on Eileen… apart from Come on Eileen). PS I have also felt inspired to go back to Searching…and that sounds brilliant…and much more accessible! Definitely an easier introduction to the band.